I introduced Hanover Foods last week as part 1 of a two part series on the company. In the first post I gave a background of the company and some investment highlights. My goal in this post is to backfill some of the investment highlights with financial details. To be honest I really struggled with what to put in this post. It's easy to go overboard with facts and figures, and while more information might make an investor feel comfortable it doesn't make a thesis any better. In the end I decided that I wanted to show that Hanover Foods is both safe and cheap so I'll provide the background to support those assertions. I also have a small addendum with details on how to find further information on the company. Saying a company is safe can mean a variety of different things, safe as in strong earnings power, or safe as in a rock solid balance sheet? I really like David Merkel's analogy of stability as a bike vs a table. What's unique about Hanover is are have both, they have the bicycle stability (earnings) and table stability (balance sheet). If the company keeps moving forward their earnings provide stability, and if all earnings stop their balance sheet provides a backstop. The two most important values on this worksheet are the Net Current Asset Value and the NCAV + Fixed Assets. NCAV is a rough approximation for liquidation value. In the case of Hanover Foods if they liquidated today it's plausible a shareholder would receive $102.57 a share, that's a good $10-20 higher than the current share price. The second value is what I would consider a tangible book value for Hanover Foods. I exclude goodwill, prepaid expenses, intangibles, and other assets. When looking at earnings these intangibles are important because they could be things that drive the business such as the brand, or franchise value. When looking at the balance sheet and trying to descern the safety of an investment I'm more concerned about the tangible downside. In both cases, liquidation value, and tangible book the value is much higher than the current share price. Of note is that tangible book is almost double NCAV which accounts for the large manufacturing operation Hanover runs. If we add back in all the intangibles and goodwill to my tangible book value the result is $252 a share, which is the same as shareholder's equity on the balance sheet. In summary from an asset value perspective Hanover has a value of somewhere between $102.57 and $252 a share. The second aspect of Hanover Food's safety is the stability of their earnings power over the past few years. I only have the past few years courtesy of a reader who's been a shareholder as long. What I'm missing is the gap of data between 2004 and 2008, a period of four years. I'm sure after looking at the spreadsheet readers will be questioning my phrase "stability of their earnings power". Revenue has been somewhat stable for the past few years, consistent would probably be a better word. The question is why did the company earn $20.80 on $379m in revenue and only $16.26 on $425m in revenue this past year? The answer can be found in the line item "Selling Expenses". Cost of goods sold and administrative expenses have remained steady but selling expenses have been gliding upwards. Selling expenses in the frozen food industry means grocery store promotions and advertising. Hanover is having to offer more and more coupons and spend more on advertising to get consumers to part with their money. I love anecdotes so I'll throw in my two cents, my wife has seen an uptick in Hanover coupons in the Sunday paper these past few years. This could be the company trying to keep up with the couponing fad, or a response to changing consumer habits from the recession. I don't know if this is a permanent shift, or something that might be reduced once the consumer is back to their normal spending habits. What I do know is that this is the sort of piece of information that investors will dwell on, and in the end it doesn't make a huge different in the thesis. From an earnings stability standpoint Hanover Foods has been generating earnings in the 3-4% net income range for the past four years which included the recession. The earnings of $16-26 a share isn't insignificant when considering their shares trade at $80(A)-90(B) a share. I don't know what an exact intrinsic value for Hanover is, and I doubt anyone really does. I'm willing to bet if you got John Warehime on the phone this afternoon and asked him for the exact fair market value of his company he'd probably balk and then give a range. I'm going to do the same, provide a range of plausible values for Hanover Foods with supporting evidence, none of which is a discount cash flow analysis. The absolute lowest value that Hanover should be worth is their liquidation value which I mentioned above at $102.57. If we continue to look at them on an asset basis we get $209 as tangible book value and $252 as book value. For a stable company I would be surprised if in an acquisition scenario they went for less than book value, but stranger things have happened. The second worst case scenario I'd consider is what the company paid for shares back in 2004 when they went dark. At the time they had an appraisal done which pegged fair value at $131 for the A shares, and $138 for the B shares. Since then the company has grown at about 8% a year, so it would be crazy to think it's now somehow worth less than it was in 2004. Another data point to consider is what the company itself thinks shares might be worth. In their 2011 annual report they state they have a standing offer to buy back 6811 shares of their class A stock for $1,027,000. This comes out to $150.78 a share. Finally the last data point is what the company's own earnings power supports. 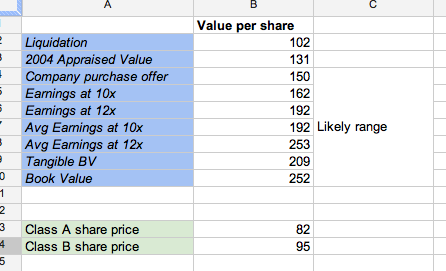 Using a 10x multiplier on the last year of data we get $162 a share. Using a 10x multiplier on the average earnings for the last four years we're sitting at $211/sh. I think a P/E of 10x is reasonable although something closer to 12x might be more appropriate. At 12x with the same figures as above we get a range of $192/sh to $253/sh. With these four methods we get a range from $102 all the way to $250 a share, and remember you can buy the A shares today for $82. I think a more accurate range is from $150-250 a share, more than double today's quote. It's probably possible to pick up B shares in the $80/sh range as well if you use a limit order and are patient. After my last post I received a lot of emails and comments asking where I was getting my information from on Hanover since they haven't filed with the SEC since 2004. Hanover has gone dark which means they no longer publicly file. They do still distribute an audited annual report along with quarterly reports to shareholders each year. This was on provision the board of directors insisted on as part of the going dark transaction, and the company has followed through the last eight years. To get a copy of the annual report an investor needs to buy one share or more of the company, either the A or B shares. Once they own the share they can call Hanover and request a copy of the latest annual report. All shareholders will receive the quarterly and annual reports automatically once they own a share and as long as they hold. The first issue a shareholder will face is getting the reports, the second is trying to figure out the shares outstanding. There are preferred shares, class A shares (non-voting) and class B shares (voting). What convolutes this is there is also an Employee Stock Ownership Trust (ESOT), and an Employee Stock Ownership Plan (ESOP). The ESOP owns B shares that have been issued, so the ESOP's shares can be subtracted from the total outstanding. The ESOT is a lot dicier and more confusing. I have read a lot of documentation on this and the conclusion is to subtract out the ESOT shares as well. There are court filings that support this presumption along with company statements as well. The number of shares outstanding I ended up with was 754,000. I've talked with a few other Hanover investors and we all ended up in the 750,000 range give or take a few thousand shares. Hanover Foods is what I expected to find when I started looking through unlisted companies. I was looking for decent companies that were selling at unreasonable valuations due to the difficulty in obtaining information. Hanover Foods surely fits that description. For an investor buying an A share today the company is earning $16 on your investment of $82 or a 19.5% investor return. Even the B shares which are a bit pricier offer about a 17% investor return. This return assumes the company continues to grow at the same pace they have in the past and the share value stays depressed. Of course as I laid out above I think that Hanover Foods provides a nice compounding return, but more so they provide the opportunity to benefit as the shares rise into the fair value range, at double todays trading price. Disclosure: Long Hanover B shares, will acquire more if the opportunity arises. I might be misunderstanding here, but why do you consider liquidation value to be the undiscounted NCAV of $102.57 versus the discounted NCAV of $17.58? In an ideal world, wouldn't you prefer to see the stock trading south of $18 to provide you with a sufficient margin of safety in a scenario where the receivables and inventories can not be recouped at 100 cents on the dollar? Good comment, I think in a liquidation the inventory (the largest part of NCAV) would probably be sold at close to normal value. Have you ever seen a going out of business sale for a brand of food at a grocery store? I never have, usually a brand will be discontinued, but the company will sell through all their inventory at normal prices before ending the product. I think the same thing would happen with Hanover, they'd just sell through inventory at current rates. So with that if you wanted you could discount receivables and you'd have a modified discounted liquidation value of $90 a share. The net-net worksheet might be misleading, this happens to be a decent business selling below NCAV, it really should be looked at more on a book value basis. This is because the book value (property, plant, assets etc) are generating a decent return for shareholders. I put the net-net worksheet in there to show how absurd the valuation for Hanover is at current prices. The shares might trade lower, but if you're waiting for $18/sh to buy with a margin of safety I don't think you'll ever end up acquiring Hanover shares. If you would be so kind, could elaborate a little on the differences between class A and B shares? The only difference between the two shares is that each share of B class stock gets a vote, while the A shares don't have voting rights. Outside of the voting rights the shares are the exact same. There are more B shares outstanding, but most are owned by insiders. My guess is liquidity is probably a bit better with A shares since they are mostly held by outside investors. What is Hanover doing with all of its cash? Based on the income statements that you summarized, it's earned ~$84 per share the last 4 years but it only has ~$9 of cash per share on the balance sheet. Do they pay a dividend or have they been paying down debt? Back in Part 1, you mention that they've done quite a few acquisitions. Any idea of how those have worked out? The acquisitions seem to have been very prudent and working out well. It seems a lot of the debt stems from acquisitions, and they've been pretty aggressive in paying it down. What do you see as being the likely catalyst for fair value being realised here? Is it simply change at the top with John Warehime being replaced as CEO? I think you're right, a change at the top is hopefully what's going to get this stock moving. John Warehime is 75 years old so at some point he's going to retire. He has three kids, and John's brother and sister have a bunch of kids who are all heirs as well. My hope is all those kids just want the money and decide to sell the business. I am big fan of your blog, this is one of my favourite blogs/pages. Thanks a lot for your job. I am wondering if when analyzing shares like HNFSA trading below NCAV value if you care at all about FCF and if you have any idea about FCF for Hanover Foods? Thanks and keep the good job. Thanks for the comment, to answer your question, yes I do care about FCF even with net-nets. Hanover was almost a but different, they're a net-net but I really looked at them like a two pillar stock, both earnings and book value support each other. The company is growing at about 8% a year as well, so buying low gets a high compound rate on your purchase price. For two pillar stocks I'm more worried about the quality of the business and if they're really worth book. In Hankver's case book value is now around $270 a share. And in a buyout they could easily go for $300. Nate great analysis. Why did you purchase b vs a shares? Did you use a broker? Or online with a limit order? Could you please post the most recent annual report on here? That would save everyone a great deal of time and trouble having to go through the whole song and dance with the company. Alternatively, do you have contact info for the person(s) at the company responsible for mailing the annual report? Much obliged. I don't know who's responsible for sending the report, my broker handles it. I can scan a page or two at a time, with my scanner it takes a frustratingly long time to scan a large document. If you want I can mail you a copy, just shoot me an email at the address listed above. It's simply not feasible to scan a 30-40 page document, Hanover is fairly straight forward in sending shareholder documents as well. I'm not in the business of posting unlisted annual reports. I do post summary financials on my site, from there if you're interested it's best to buy a share and get the annual report in the mail or however your broker distributes it. I used Fidelity, they foreword me all correspondence from my holdings via mail.